Freelance is a full-fledged distributed control system (DCS) that combines the advantages of DCS and PLC: the small footprint of a PLC, together with the full functionality of a DCS. The integrated environment simplifies engineering, commissioning, maintenance and fieldbus management. The intuitive operator interface enables easy operation and diagnosis of the entire system. Freelance is proven since 20 years and fully compatible with older versions. With the new, award-winning AC 900F controller, the Freelance DCS provides more power, speed and functionality than ever before. Following years of experience in automation and control products, this newly released controller truly extends the hardware portfolio of the Freelance distributed control system (DCS). The AC 900F controller consists of a CPU module, which is the main component. 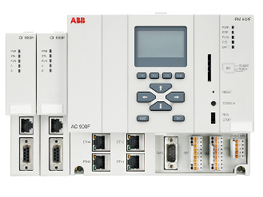 According to the application and requirements, fieldbus modules and I/O modules can be added to the controller. Optionally, AC 900F supports redundancy. The controller supports remote I/Os, transmitters, actuators, drives and other devices, for example through PROFIBUS and other fieldbus protocols.